Packing. Ugh, the packing! If possible, pack computers and other electronics in their original containers. 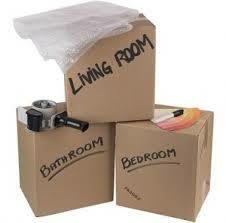 For fragile items, like glassware and dishes, pad the bottom of boxes with a bubble wrap or other packing materials. Mark the outside of all boxes with a short description of the contents and the room the box should be placed in. Write these notes in the same location of every box. Pack plates vertically like records so they are less likely to break. If moving your refrigerator, remember to defrost one day in advance of the move. Don’t forget about mowers and grills. Drain fuel from your lawnmower and discard and recycle the propane tank from your grill. Pack an overnight bag of essentials, including clothing, medications and cell phone chargers. Pack a bin of other items you will first in a clear plastic bin. Make alternate arrangements for pets so they are not part of the move day chaos. Whew, you ready? Moving is stressful and a tremendous amount of work, but with a good plan and a healthy amount of patience, you will get through it and soon be settled into your new home. Also don't forget to prepare a separate box for all of your documents and valuable items and jewelry. The best thing to do is keep them with you in your car, so you are not worried something could happen. I just found out that I am moving, and I need to be moved in just three weeks! This isn't very long, so I definitely need to get started on changing my address and getting help packing. I think that it would be really good for me to start out by trying to sell and donate a few things. Since I have such a short amount of time, I also think that it would be in my best interest to get a moving service so that I don't have to do all of this on my own.